The female was young and conscious on admission, this showed a chance of better prognosis. However in this patient for a period of nearly 1΍ years, there was no significant change in the functional abilities during the entire course of Allopathic treatment. It was observed that the functional deficits improved during the course of Ayurveda treatment. The patient was admitted in an Allopathic hospital with the complaints of numbness over left half of the body for 2΍ months, involving right half of the face for 3 days with weakness of left half of the body for 1΍ months, blurring of vision, impaired hearing of left ear and slurring of speech for 20 days, difficulty in swallowing was present for 3 days along with breathlessness. The patient did not have any history of hypertension. She was diagnosed with spontaneous pontine hematoma and underwent midline sub occipital craniectomy and evacuation of clot and evacuation hematoma by trans vermian approach under general anesthesia and was discharged after a month on 11 th Dec 2007. She later developed right eye neurotrophic ulcer with lagophthalmos and sustained paramedian tarsorraphy. Anti-glaucoma medications were started after admitting her to hospital again on 11 th Jan 2008. Dental consultation was sought for the inability of the patient to open her mouth and then on the patient was under tracheostomy. The patient was discharged from the allopathic hospital on request on 9 th Feb 2008. At the time of discharge, patient was oriented and conscious with Bilateral VI nerve palsy and right side mild lower cranial palsy. The patient complained of paralysis of left side of the body along with weakness and severe shivering of the right hand and head. She was bedridden and was unable to sit upright without support when she was brought for Ayurvedic treatment. The timeline depicting the treatment has been presented in [Figure 1]. Magnetic resonance imaging (MRI) taken prior to treatment showed acute parenchymal hemorrhage in the pons (dt. 13 th Nov 2007). MRI dt. 11 th Feb 2009 showed an old hemorrhagic lesion measuring 1.4 × 1.2 cm in the right dorsal pons and impression mentions no increase in the size of the lesion. MRI showed no active lesions in the brain. Minimal gliotic changes in right pontine region. No complaints of hydrocephalus (dt. 24 th Nov 2009). The patient was under Ayurvedic medication for a continuous period of 8 months from 5 th Mar 2009 to 24 th Nov 2009. She was on internal and external medication during this period. At present, she is not under any medication. Internal medication - Sahadevi root kalka (Vernonia cinerea [Linn.] Less.) 5 g twice daily, Nimbāmṛtādi pañcatiktakam kaśāyam 60 ml (freshly prepared), Varaṇādi kaśāyam 60 ml (freshly prepared) twice daily, Rasa sindūram capsules twice daily, Daśamūlaharītakī lehyam 10 g. After 2 months Brāhma rasāyanam 10 g was started. The internal medication was continued for a period of 8 months. External - Abhyaṅga (oil massage) was done for 7 consecutive days in the first and second visit with Dhβnvantaram tailam,  patra poṭṭali sveda (use of poultices) and mṛdu virecana (purgation) was done in the third visit. The medication details are furnished in [Table 1]. After 41 days of treatment, the shivering on right hand and head reduced slightly. Mild pain and numbness was felt in the body. The sensation of pain was felt by the patient only after the treatment. Gradually with 2 months of treatment she could walk with the support of two people. The shivering also reduced moderately. By the end of 8 months of treatment, she had the functional abilities of the hand and leg restored. She could walk without support. The shivering of right hand and head stopped. The patient was diagnosed with spontaneous pontine hematoma based on MRI and had surgery done as per the treatment protocols of modern medicine. From the Ayurvedic point of view, the condition was treated as granthi (cyst) associated with śopha (swelling) in the brain. Due to the involvement of rakta (blood) and śopha, Sahadevi root, Daśamūlaharītakī lehyam and Nimbāmrtādi pancatiktakam kasāyam was used. Varaṇādi kaśāyam was used as it is indicated in antarvidradhi (internal abscess and growth). Rasa sindϋram was used to accelerate the effect and Brāhma rasāyanam was indicated for the purpose of rejuvenation. Dhānvantaram tailam was used for its general effect in pacifying Vāta and improving motor functions. In Allopathy, surgery is the treatment of choice in which evacuation of the clot is performed and this has been found to help the patient get back to normalcy in some cases. In this particular case, the patient developed right VIth and VIIth nerve palsy along with clinical symptoms. It was 1΍ years after the onset of the disease that she started Ayurveda medicines, during which period the patient did not respond well to Allopathic treatment. There was significant change in the functional parameters such as grip, flexion and extension of the limbs and improvement in walking during the period of Ayurvedic treatment. MRI showed that the patient had an active lesion before the start of the Ayurvedic medication and that there are no active lesions in brain after the course of the Ayurvedic treatment. The patient improved clinically after the Ayurvedic treatment. 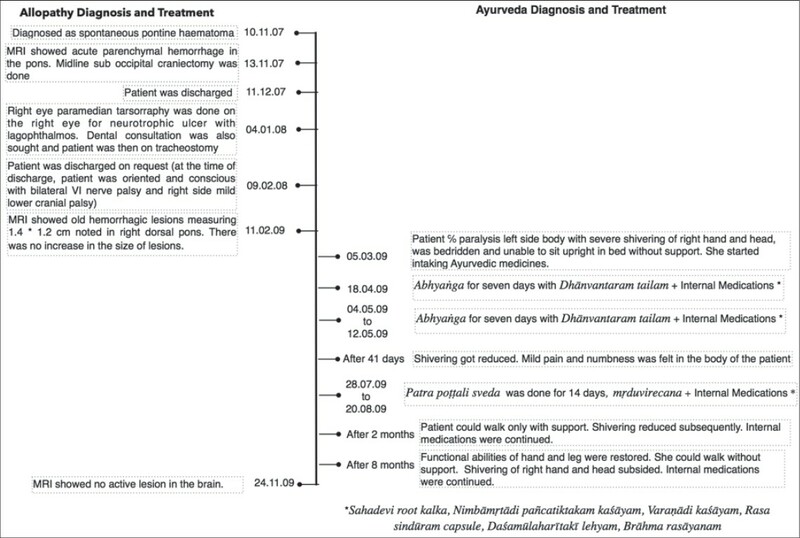 This case is a pointer to the potential benefits of Ayurvedic treatment in patients with pontine hematoma who do not recover satisfactorily after surgery. Observations of more cases and rigorous well-designed studies are warranted to arrive at conclusive evidence regarding the benefits of post-surgical management of pontine hematoma with Ayurvedic interventions. 1. Moncayo J. Pontine infarcts and hemorrhages. Front Neurol Neurosci 2012;30:162-5. 2. Wong SK, Duffy GP. Surgical treatment of spontaneous pontine haematoma. J R Soc Med 1982;75:206-9. 3. Wijdicks EF, St Louis E. Clinical profiles predictive of outcome in pontine hemorrhage. Neurology 1997;49:1342-6. 4. Vagbhata. Ashtanga Hridaya, Cikitsa Sthana, 21/58-61. In: Bhisagacharya Harisastri Paradakara Vaidya, editor. 9 th ed. Varanasi: Chaukhambha Orientalia. 2002; p. 726. 5. Vagbhata. Ashtanga Hridaya, Sutra Sthana, 15/21-22. In: Bhisagacharya Harisastri Paradakara Vaidya, editor. 9 th ed. Varanasi: Chaukhambha Orientalia. 2002; p. 236. 6. Jha C, editor. Ayurvediya Rasashastra. Varanasi: Chaukhambha Surabharathi Prakashan. 2003; p. 178. 7. Vagbhata. Ashtanga Hridaya, Cikitsa Sthana, 17/14-16. In: Bhisagacharya Harisastri Paradakara Vaidya, editor. 9 th ed. Varanasi: Chaukhambha Orientalia. 2002; p. 706. 8. Vagbhata. Ashtanga Hridaya, Uttara Sthana, 39/15-23. In: Bhisagacharya Harisastri Paradakara Vaidya, editor. 9 th ed. Varanasi: Chaukhambha Orientalia. 2002; p. 924. 9. Vagbhata. Ashtanga Hridaya, Sarira Sthana, 2/47-52. In: Bhisagacharya Harisastri Paradakara Vaidya, editor. 9 th ed. Varanasi: Chaukhambha Orientalia. 2002; p. 383.